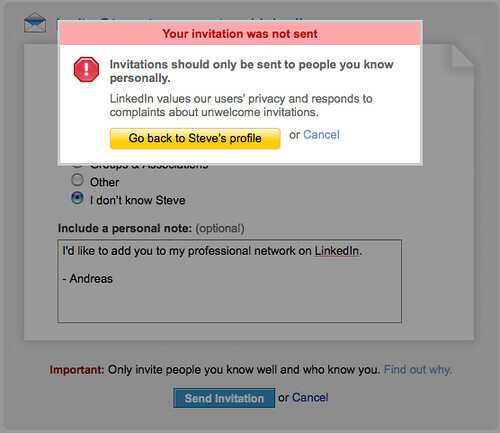 I did another guest post on UsabilityBlog.com, this time about the annoying "user trap" when adding a new user to your LinkedIn network. You might remember my last article about the Sony Ericsson PC Suite. I thank Paul for letting me contribute another article. A copy of the post is archived below. If you want to comment about the article, you can do so at the UsabilityBlog. How fast things change. I wanted to write about a workflow in LinkedIn, which had annoyed me for months, but they have fixed it in the meantime, before I could publish the article. 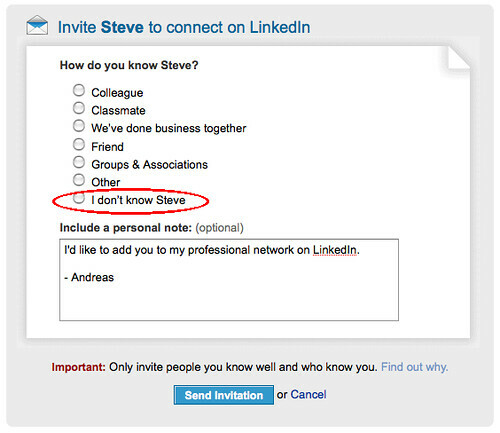 One of the most used functions in Linkedin is to add a new user to your own network. If you don't know the e-mail address of the person or other personal information you can choose "I don't know xy". The only way to proceed is to click "Go back to xy's profile". The personal message is lost! 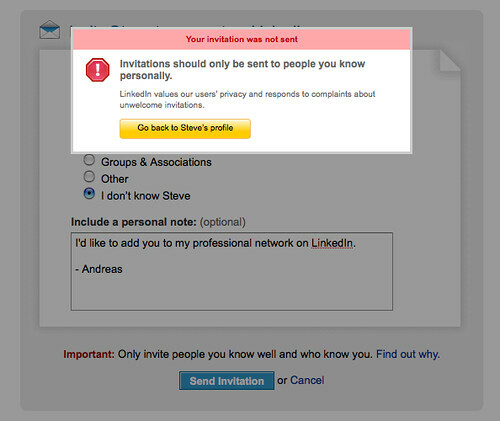 You stepped into the Linkedin user trap. Of course, according to the Linkedin policy you're supposed to add only contacts you personally know, but since you can bypass this rule anyhow by selecting "Friend", it's illusory to educate the user by punishing him to re-enter a personal message. - Pop up the message immediately, when the user selects "I don't know xy", instead of giving him the feeling, that he now can enter a personal message for that person. As we can see, they solved it with a "close" link.